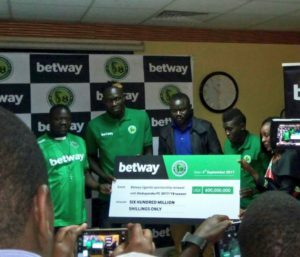 Online betting company Betway has renewed their partnership with Onduparaka Football club to the tune of Shs600 million ahead of the new season. The deal was made official on Monday morning at Hotel Africana in Kampala. Anton Opparman the Country manager Betway, believes Onduparaka FC have lived up to their expectations and that is the reason why they have renewed their commitment. “Betway is pleased to announce our continued support and commitment to Onduparaka FC this season 2017/18,” he said. “We are excited to be part of the journey with Onduparaka FC that bought passion back into the game with increased number of fans in stadia. Onduparaka FC has the biggest fan base and inspired other clubs to come up with strategies to enhance their fan base,” he added. The Shs600m is an increment from the Shs180m that Betway offered the West Nile giants last season. Benard Atiku, the Member of Parliament for Ayivu County and also the club patron, thanked Betway for the commitment and promised to perform better this season. “We are grateful for the partnership with Betway. We had a wounderful season last with them on board and with the revamped partnership, I believe we shall perform better,” he said. Onduparaka FC finished 5th last season in their maiden in the Uganda Premier League campaign and have already signed a few players including former SC Villa and Lweza striker Karim Ndugwa, goalkeeper Nicholas Ssebwato and Rajab Kakooza among others. They start the season with a home tie aganist Proline FC at the Green Light stadium in Arua before travelling to Luzira Prisons stadium to play managerless new comers Maroons FC.